The Seneca County Jr. Fair Foundation, originally established in 1971 as the Seneca County Jr. Fair Building Fund, was incorporated and registered with the State of Ohio as the present name in 1979. It is a non-profit, tax-exempt and an all volunteer organization. Its purpose is to improve the welfare of the Seneca County Fair which occurs on the Seneca County fairgrounds located at 100 Hopewell Ave., Tiffin, Ohio. The organization is dedicated to providing an opportunity for the youth of Seneca County to learn and develop leadership skills through participation in Jr. Fair activities and programs. A board of 23 trustees elected from the membership manages its operation. Membership is open to anyone participating in the Seneca County Jr. Fair and its supporters. The Seneca County Fair has two divisions of participants involved in comprising fair activities which are a Senior Fair involving adults and a Jr. Fair involving youth ages up to 21 years. The Jr. Fair division has participating youth from organizations which include 4-H, Future Farmers of America, Boy Scouts, Girl Scouts, Farm Bureau and many others. There are about 1500 youth from these organizations involved in 200 different projects available having 2,500 exhibits at the fair. The Seneca County Fair usually occurs the last week of July. 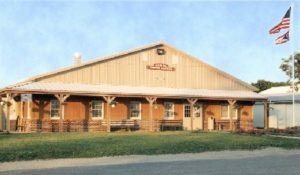 Years ago, it was a farm related occurrence with exhibits coming from the many family farms in the area showing their prized livestock and home cooking skills. Today, the scope of participation has broadened to include the urban section with a much larger variety of exhibits now available. The fair still provides an opportunity for the many residents of the county and surrounding area to meet, renew friendships and visit. Good food and entertainment is always available. The Seneca County Jr. Fair is very active and is proud of its youth that participate with their exhibits they bring to the County Fair. It is a family affair with parent and child sharing the experience of coming to the fair and exhibiting the project which may have started the previous year. It is a teaching of a family relationship, responsibility, determination and dedication to complete a project that a person has started. The origination of this organization was started with a vision in 1971 of the growth of interest and energy waiting to become involved in the Jr. Fair at the present time and in the future. There was limitations at the time for this growth to materialize. Lack of room in buildings for exhibits and improvements needed in other buildings on the fairgrounds to accommodate this expanding interest was obvious. A few families of youth exhibiting at the fair at the time took their concerns to heart and put their energies into action. Ideas for the needs of the future was considered. Interest grew. More families became involved. They knew that any success with their ideals and goals would take monies that would be hard to come by. Word of the intentions of this group grew. Interest and support came. Fund raising activities were started with projects of all kinds being promoted. The Tiffin Flea Market is one of many fund raising activities. Today, three major building projects have been completed. The first one was the construction in 1973 of a swine and sheep exhibit building for housing of the animals with a show arena. Jr. Fair youth had been limited to participation because of lack of room. After construction of this building, exhibits tripled within 3 years. 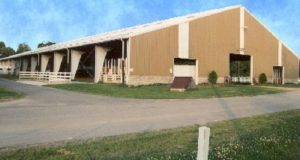 The second building project was the construction in 1979 of a beef and dairy 300' x 120' area exhibit building for housing of the animals with a show arena. Again, exhibits increased dramatically with opportunity available for participation. The third building project was the construction in 1992 of a 60' x 80' area youth center building. The building provides a kitchen and dining room area, meeting room, office space, restrooms and showers. The building is used year around by youth groups, various organizations and private rentals utilizing it for meetings, activities and celebrations. Total funding as of 2001 for support and improvements by the Seneca County Jr. Fair Foundation for the Seneca County Fair is $ 711,000 Interest in the organization is still strong. Ideas are still being considered for improving the welfare of the Seneca County Fair.